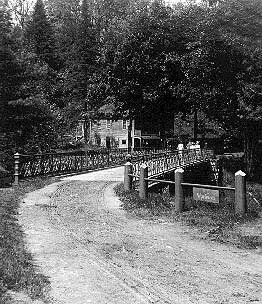 "Bridge at Glen Iris, Portage Park"
This image is taken along the road in front of what is now Pine Wood Lodge, looking north toward Eagle Hill. It shows the bridge that Mr. Letchworth had built across Deh ga ya soh Creek, replacing an earlier wooden bridge. The sign hanging on the railing to the right points visitors toward the "refreshments" served in the building across the Bridge. That was Maria Davis' house, which served homemade root beer at 5 cents a glass to early Park visitors. Another view of the Davis house is found below. "Aunt Maria" (as the local folks called her) lived on the Davis property until her death in 1915. She is buried in the Pioneer Cemetery. This view is from a post card of the 1910 era. 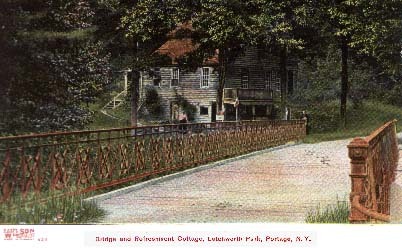 It is labeled "Bridge and Refreshment Cottage, Letchworth Park, Portage NY.